Landscaping is one of the most important features of your property. Your landscaping choices as a Shore Steward will affect soil stability, fish and wildlife habitat, water usage, and water quality. Plants of the Pacific Northwest Coast — Washington, Oregon, British Columbia & Alaska, Jim Pojar & Andy MacKinnon, editors., 528 p; Lone Pine Publishing, 1994. Gardening with Native Plants of the Pacific Northwest, Arthur R. Kruckeberg, 284 p; UW Press, second edition , revised 1996. Citizens Guide to Noxious Weeds, King County Noxious Weeds Control Program, 52 p, 2006. Washington State Compost Educator’s Guide, Westcott, Bary, Cogger, & Sullivan, Washington State University & Washington Dept of Ecology, 2009. The use of compost helps to improve the soil structure, allowing roots to easily penetrate the soil and increase water retention. Nutrients in compost are released slowly and are less likely to leach out of the root zone. You can make your own compost from yard waste and kitchen scraps. Compost is also commercially available for those who want the benefits without the work of creating their own compost. Because you live so close to the water, it is especially important for Shore Stewards to practice safe pest control. Most pesticides and herbicides contain synthetic chemicals that could have harmful effects on non-target plants and animals, including pets, humans and beneficial insects. Even some of the ‘safer’ alternatives can be harmful to the environment. You can eliminate or reduce the use of dangerous chemicals and still control unwanted plants or pests by using the following methods. Incorporate Northwest native plants into your landscape. These plants seldom need pesticides or fertilizer and many require little or no extra watering once established. Encourage habitat for beneficials. Native plants create a welcoming environment to beneficial insects and animals. Some of these insects provide safe pest control and are not bothersome to humans. Provide healthy soil for a healthy garden. According to WSU, healthy plants that are attacked by pests produce chemicals that attract beneficial insects. Keep your non-native plants healthy by giving them compost and mulch. Compost will boost soil health and increase microorganism populations creating a vibrant soil ecosystem resulting in healthy plants in your garden. Try to tolerate some pests. Insecticides can often harm the soil microorganisms needed for healthy soils and the beneficial insects that are predators to garden pests. For almost every pest there is another organism that preys on it. By using some “broad spectrum” pesticides you may be killing the natural predators of the pest. Keep in mind that healthy plants can survive some pest damage. Use safe and effective alternatives. Horticultural oils, insecticidal soaps and the bacteria Bacillus thuringiensis (Bt) are sometimes referred to as “soft pesticides.” They do less damage to beneficial insects and are effective when used properly. Always follow instructions. When using any pesticide product, follow the directions carefully and use only when they are appropriate. Safely dispose of pesticides. All pesticides are considered hazardous waste and must be disposed of at a hazardous waste site. In Washington it is illegal to dump them in the trash or down the drain. For more information on hazardous waste disposal, contact your local solid waste department. In many counties, it is free to dispose of household hazardous waste. When a plant is growing in a place where it is unwanted, we call it a weed. Many weeds were brought to our area as garden plants that have now spread into the wild. These plants are often adaptable, hardy, and have the ability to choke out native species. Invasive weeds are particularly aggressive non-native plants and are considered noxious if they are harmful to the environment, people, livestock, and/or agriculture. An example is Himalayan knotweed, which can take over stream corridors choking out native plants and reducing wildlife habitat. Some weeds are legally listed by the state and county as ‘noxious weeds,’ these weeds are required to be controlled. Check with your county Noxious Weed Control Board www.nwcb.wa.gov/ to identify listed noxious weeds. Avoid disturbing the soil. Many weed seeds remain in the soil, waiting for light to initiate germination. If left undisturbed, they will likely remain dormant. Avoid the use of tillers, and hand-cultivate lightly, if at all. Use organic mulch. Smothering the weed seeds with organic mulches (straw, layers of newspaper, mulch, and cardboard) will block the light out and will eventually degrade, improving the soil. Use wet paper or cardboard. Wet the paper or cardboard, and the ground beneath, to keep it from blowing away. 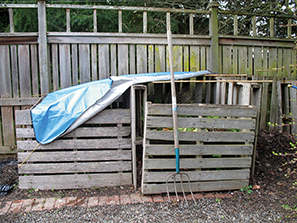 Spread mulch 2–4 inches deep above the cardboard, which will retain moisture while suppressing weeds. Be sure to use straw, not hay (which contains seeds that will sprout). Remove invasive weeds as quickly as possible. Invasive weeds should be removed as quickly as possible before they spread. Other weeds however, like non-spreading annuals, may be beneficial by allowing their roots to hold valuable topsoil in place and not allowing it to be blown or washed away. Think twice before removing weeds from bluffs. When considering removing weeds from a bluff, exercise extreme caution. Some weeds have deep taproots and removing them could cause erosion or even a landslide. Sometimes cutting the weed off at the ground (scotch broom) will work, but sometimes it is best to leave the weeds on bluffs alone. Don’t plant too deep. 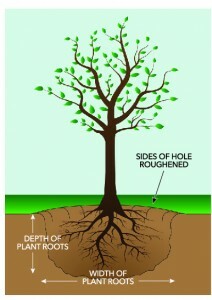 The top of the root ball or plant crown should be at the same level or just one-half inch above the surrounding soil. If planted too deep, the plant stem can rot and the roots suffocate. Disturb roots. Remove the plant from the pot and pull loose roots outward and cut or straighten any that are encircling the root ball. This encourages the roots to grow into the surrounding soil. If it no longer looks like a root ball, you’ve done well. Don’t dig your hole too deep. 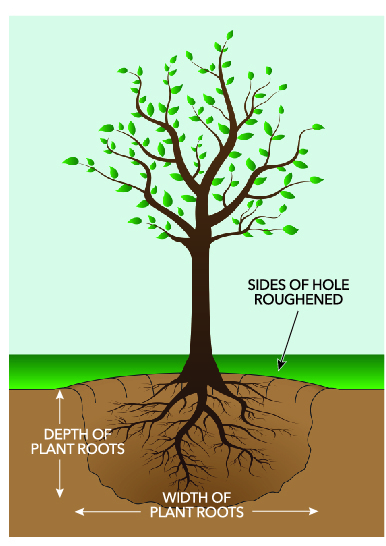 Dig a saucer-shaped hole that is 2–3 times the width of the root mass. Build a mound of soil at the bottom of the hole. Splay out the roots so they are pointing to the surrounding soils. Don’t add soil amendments. Coastal plants are adapted to low-nutrient soils. Adding fertilizer or compost in your planting hole will encourage weeds as well as discourage the roots from spreading into native soils. Don’t stomp! We were taught to really pack those roots down—sometimes even pushing down with our feet. This can tear the roots off your plant, which definitely isn’t good for them. Compact the soil with your hands. that appear. If you are adding mulch as a weed suppressant, be sure to keep the mulch from touching the stem of the plant. Newly planted natives need regular watering their first two to three years until they’re established in a landscape. Water more the first summer, and much less with each passing year so the plants adapt to the drought conditions they’ll ultimately have to endure on their own. For more home gardening information go to gardening.wsu.edu. A great way to increase native plants in landscape is to dig seedlings from your yard and transplant them elsewhere. There are several excellent native plant nurseries in the region. Most local conservation districts have annual native plant sales in mid-winter, and many have guides on their websites. WSU Master Gardeners also have plant sales. The Washington Native Plant Society has plant sales, classes, field trips, and online resources. 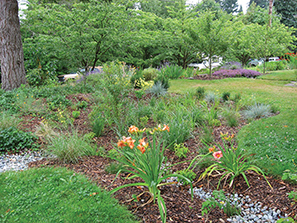 On their website you’ll find Native Plants for Western Washington Gardens and Restoration Projects, with a link to “Native Plants for Saltwater Shoreline and Saltwater Habitats”. To increase plant survival rate in your yard, do some research before you buy any plants. Some native plants like dry rocky soils and others like moist, humus-rich soils (like the duff in a forest). It’s important to know what the cultural requirements are for each plant. Things to consider include soil type, water requirements, sun/shade requirements, and potential for contact with salt spray. Placing the wrong plant in the wrong place—whether native or not—may result in plants that are unhealthy, scraggly and unattractive due to stress and inability to thrive vigorously. Native plants blend in well with other ornamental plants. The trick to selecting and incorporating native plants, is to determine how much area (height and width) is available for the plants to inhabit. Some plants tend to spread, so avoid those if you want your plant to stay contained in a small space. Be sure to note the mature size and shape of the plant, since they can be vastly different sizes from what you purchase. You can always use good pruning techniques to manage their size to some extent, but you still want to select the right-sized plant from the start. There are many excellent resources available to learn about specific growing needs for each plant—both in books and on the internet. There are also many ornamental grasses that do well along the shoreline. Look for grasses that clump instead of spread, and be sure they are not listed as being either invasive or too aggressive. Increased soil stability. The best way to maintain soil stability is to retain existing native vegetation. Plant roots can reinforce the soil, increasing the lateral soil sheer strength and cohesion during wet or saturated conditions. In addition, plants absorb and remove water from soils. Evergreen trees and shrubs are ideal choices since they continue to use water from the soil even in our wet winter months when deciduous plants have gone dormant. these are an important part of the food chain that supports marine mammals and salmon. Many other species dependent on cool, moist environments experience increased stress or mortality when tree cover is lost. Increased salmon food. Marine fish, like salmon, have been found to eat insects from the terrestrial environment that are provided by overhanging vegetation. More research is still needed to determine the true extent of salmon dependence on these terrestrial bugs. However it is believed that as vegetation is eliminated along our marine shorelines, the food supply is diminished for a range of fish.